While a car wreck is scary enough, it isn’t the end of the confusion! Figuring out your next steps can be stressful and overwhelming. 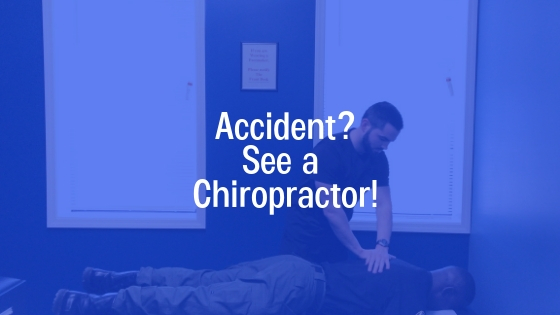 In this blog, we will go over five reasons why heading to a chiropractor after an accident is an excellent idea! After a minor car accident, it may be easy to think that you don’t have any injuries. However, due to the nature of most wrecks, injuries such as whiplash are unavoidable. It’s important to get these types of injuries looked at and adjusted by a skilled chiropractor. From back pain to a lowered system, inflammation can affect just about every function in your body. Chiropractic care focuses specifically on breaking up inflammation and letting your body heal naturally. Almost any injury can affect your range of motion; especially untreated post-accident injuries. Chiropractors are specially trained to work with patients suffering from issues with their range of motion. Who knows, you just may leave being able to touch your toes! Another huge reason to be sure and visit a chiropractor after an accident is to prevent further long term problems. When left untreated, the previous issues such as inflammation and range of motion will lead to worsening symptoms, as well as the need for future medical procedures. If the car accident was not your fault, the other person’s insurance is responsible for your medical treatment. Seeing a chiropractor for treatment will strengthen your claim and help ensure you get the financial compensation you deserve! Our team at Arkansas Chiropractic is here to help you with everything from your invisible injuries to boosting your legal claim! Our staff and doctors are the best in the game. Schedule an appointment today!